EUNICA (Extensible Universal Control of Appliances) is a prototype of an intelligent household system, developed by a team of five students from the Slovak University of Technology in Bratislava. With this system, the team won the fourth price at the annual IEEE Computer Society International Design Competition (CSIDC) World Finals. Rastislav Habala, Jaroslav Kuruc, Vladimir Marko, Dalibor Rak and Anton Weissensteiner are all undergraduate students at the Slovak University of Technology and worked towards a vision of a household where appliances serve a user according her/his current needs. The students designed and developed a prototype of the system called EUNICA, which is intended to deliver various home-related services to the users. It is sensitive and responsive to the presence of people (the occupants or visitors of a household). The user in the household is surrounded by a multitude of interconnected appliances. The network of appliances is invisible. Appliances serve the user according to her/his customs and preferences. The whole system exhibits some kind of intelligence, eg, it is able to recognize each individual in the household and adapt behaviour according their needs, it is able to recognize specific events (such as time or movement of a user) and act upon various situations. An important feature of EUNICA is providing mobility: mobile access to appliances on the one side and possible mobile connection of appliances on the other. The wireless technology, namely Bluetooth, which presents the primary way of communication, is granting EUNICAs great features to supersede conventional infrared remote controls. However, EUNICA is not limited to a single set of communication methods or a fixed set of appliances. It uses the open concept of loadable drivers to be ready for future appliances and technologies. The system covers features allowing access to appliances from outside of a users household via phone lines or the Internet. EUNICA also provides strong appliance management functions that are kept hidden for the standard use. It provides a secure way of appliance installation. The heart of the EUNICA is the control unit. Any appliance can be connected to the control unit using various types of connections (see Figure 1). Monitoring and controlling appliances are visualized on simple mobile Java based user interface devices connected to the control unit using the Bluetooth wireless communications technology. All kinds of inexpensive, physically compact devices, such as PDAs are allowed. We call these devices eurecos (EUNICA remote controls). They display and allow browsing information received from the control unit (represented in the EUNICA Markup Language that is based on XML) and send users requests back to the control unit. Figure 1: The overview of Eunica. Eureco design of radio control for children. To fit the system to a house of any size the access to mobile components of the system in a big house is proposed through a network of access points (realized by Bluetooth modules connected to the control unit). The appliances themselves are not part of EUNICA; however they should include support for EUNICA. From the user perspective, EUNICA is a system, which enables them to monitor and control appliances in a household by eurecos. Several eurecos can exist in the household. Any user can use any eureco, as each eureco is always adapted to the current user. To make the eureco able to easily and comfortably identify its current user, the eureco prototype is equipped with a fingerprint scanner. To simplify the monitoring and control of appliances for various individuals and groups (eg, children, adult, elder), the controls have to adapt and customise. The adaptability considers the number of control elements, its layout and appearance. In addition, EUNICA monitors users actions and adapts to their preferences (eg, EUNICA can detect the level of light brightness the user uses most often and later automatically sets to the observed level). to program various embedded appliances (heating system, alarm), and help in automatic data acquisition (eg, from various kinds energy meters). Measured data is sent through the network to the energy providers without a possibility of user intervention, so the user cannot abuse it. The eurecos can also be used to access Internet resources such as email, weather forecast or electronic newspaper. The system can support wearable computing devices for tracking physiological parameters, locating the users, etc. In the view of manufacturers EUNICA represents a straightforward extension for appliances they produce. In order to support EUNICA they should extend existing appliances with the Bluetooth or another connection technology (EUNICA provides versatility of appliance connection - by serial or parallel link, by net, AC power lines, or wireless Bluetooth). Manufacturers should develop a driver that will be dynamically added to the control unit. It will enrich the appliance with required logic, which will perform the commands of the control unit and send the state of the appliance to the control unit. Drivers and appliances are not passive components which only respond to a user requests. A wristlet on a childs hand can monitor her/his temperature and, if it increases, the EUNICA automatically notifies the parents. Drivers and appliances have to satisfy certain requirements for installing and running. These requirements ensure co-operation between drivers in the control unit, but also security. Finally, manufacturers have to design control pages in EUNICA Markup Language for their appliances. The control unit is implemented using Sun Java2 JDK 1.3 Standard Edition, because of reducing the platform dependencies and taking advantages of extensibility including security architecture and dynamic loading of new classes into the running code. These features stood in the good stead when outfitting the system with runtime module addition. The eureco is implemented in Sun Java2 JDK 1.3 Micro Edition (J2ME). It consists of Connected Limited Device Configuration 1.0.2 (CLDC) specification and reference implementation as well as Kilobyte Virtual Machine (KVM) reference implementation for various platforms including Microsoft Windows, which we used. 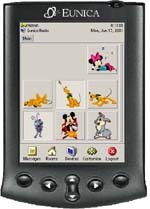 CLDC and KVM implementations are contained in many portable personal appliances such as PDA. Target platform for KVM is devices with low memory (512KB), battery operated and with limited communication capabilities, so it perfectly fits the needs for remote control. (as an appliance simulated on computer). EUNICA is designed considering security issues on several levels: security in communication between the control unit and appliances, security in communication among modules inside the control unit and avoiding unconscious and conscious misuse of EUNICA and appliances. We would like to thank our undergraduate students Rastislav Habala, Jaroslav Kuruc, Vladimir Marko, Dalibor Rak and Anton Weissensteiner for their excellent project work and presentation at the CSIDC World Finals in Washington, DC, and to ALEF, s.r.o. and APIS, s.r.o. for providing us with fingerprint scanner hardware and software development kit. The work reported here was partially supported by Slovak Science Grant Agency, grant No. G1/7611/20 and by IEEE Computer Society via Computer Society Design International Competition (CSIDC) 2001.